The term first caught fire with the popularity of General Hospital's Luke and Laura and it quickly took off from there. At a time when romance was a daytime drama's bread and butter, every soap opera had its super couples, sometimes several airing at one time. Check out our 21 Most Memorable Soap Opera Super Couples. From Bo and Hope to Tad and Dixie, we took a look at the soaps still on the air and those we still tear up over now that they're gone. When we first dove into this topic, we soon realized there were more remarkable couples on soaps than we could cover in just one article... so you'll have to check back in the coming weeks for part 2! Where to begin with this quintessential soap opera couple? Luke Spencer and Laura Webber are arguably the king and queen of daytime supercouples. Their romance had a rocky start, to put it lightly. But GH fans fully embraced the duo and even non-soap watchers recognize the name of this famous pairing. Their 1981 wedding is, to this day, the most-watched episode of any soap opera EVER. Luke and Laura had so many adventures throughout General Hospital's heyday (the Ice Princess! Dealing with the Cassadines! ), cementing their legacy in soap opera history. Though they haven't been paired romantically in many years, their 'ship was so enigmatic and memorable that they remain one of the most popular supercouples of all time, in any media. Now that Tony Geary has departed and Luke's final on-screen appearance is fast approaching, we're clamoring to see how Luke's goodbye with a recently-returned Laura will pan out. Eden Capwell and Cruz Castillo were unexpected and awesome for many reasons. First, they didn't even like each other when they first came into contact with one another. Second, they were both actively persuing other people, and, third, it wasn't the norm at the time for the pretty blonde girl to fall for the hispanic gentleman, so the racial storyline was somewhat historic in nature. They bucked it all and became one for the ages. Next to the iconic Luke and Laura, Bo and Hope were one of the 1980's original super couples. Fans will never forget Bo rescuing her on his motorcycle from her wedding to Larry Welch or their romantic first time making love at the Oak Alley Plantation in New Orleans. Despite their epic love which saw them through kidnappings, presumed dead experiences and the loss of their son Zack, it was Bo’s determination to bring down the evil Stefano DiMera that eventually drove this couple apart. Tad Martin and Dixie Cooney were a gold standard for a soap opera super couple. On their path to love, Tad needed to rescue Dixie from the clutches of Adam Chandler who, with the help of Dr. Snow, made Dixie believe she was crazy. After saving Dixie, and a chicken suit proposal, it was smooth sailing as the couple married. Meddling parents got in the way, and the pair soon divorced, but reconciled and planned to re-marry... Until Tad was presumed dead in an explosion. 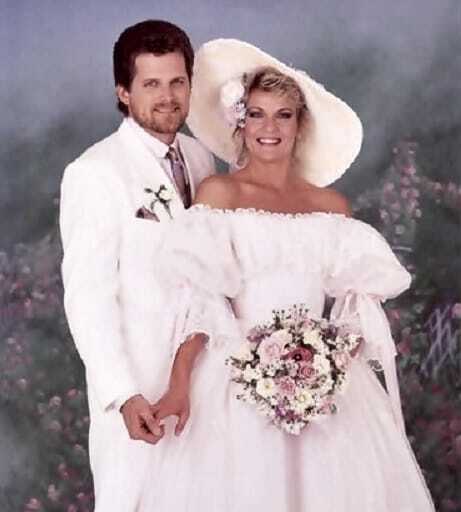 In the soapiest of soapy comebacks,Tad returned with amnesia and a new identity, but he and Dixie managed to find their way back to each other, and re-married. They would divorce and remarry one more time, Dixie would be presumed dead (twice! ), another doctor would hold her captive, and Tad would have a child with another woman, but they'd always find their way back to each other. Josh Lewis and Reva Shane spent more of their time involved with others and pining after each other than they did together, but that never diminished their love. They were one of the all time greats, always finding their way back to each other, even after Reva married every other male in Josh's family. Their wedding at Cross Creek was one of the most lauded in soap history. They each died and came back and ultimately waved goodbye on the very last episode of Guiding Light by each others side. ISA agent Shane Donovan spied on prostitute Kimberly Brady. Many of Kim's clients were connected to evil mastermind Stefano DiMera. Eventually the two began working together and Kim revealed that she was molested as a child. She left the business and the two fell in love. They endured many trials including Shane’s presumed dead wife showing up and his surprised teenage daughter. In order to save Shane’s life while on a mission, Kim slept with crime lord Victor Kiriakis which led to a question about baby Andrew's paternity (he turned out to be Shane's.) Despite it all, their love endured and their 1987 wedding was one of the most beautiful on TV. Dynasty Reboot Ordered to Series by The CW! The Young and the Restless Recap: A Win for Dylan, But is it Too Late for Adam?